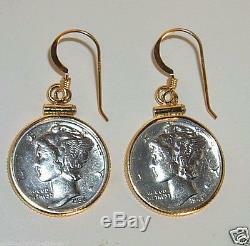 Vintage 90% Silver Mercury Dime Earrings in 14K Gold Filled Bezels. A Gift She Will Love! THESE VINTAGE 90% SILVER AUTHENTIC MERCURY DIME EARRINGS ARE FRAMED IN 14K GOLD FILLED COIN EDGE BEZELS WITH GOLD FILLED FRENCH HOOK EARWIRES ATTACHED. Although this coin is commonly called the "Mercury Dime", the image on the coin is in fact a representation of "Liberty". The wings crowning her cap are intended to symbolize liberty of thought. The designers monogram AW is to the right of her neck. MANY HAVE NEVER SEEN ONE OF THESE OLD DIMES. FOR OTHERS, THEY BRING BACK MEMORIES OF TIMES GONE BY WHEN THESE COINS WERE JUST POCKET CHANGE! THE BEZELS HAVE A SCREW ACROSS THE TOP CLOSURE TO HOLD THE COINS IN THE BEZELS HAVE A SCREW ACROSS THE TOP CLOSURE TO HOLD THE COINS IN SECURELY. THESE ARE HIGH QUALITY BEZELS MADE IN THE USA SECURELY. THESE ARE HIGH QUALITY BEZELS MADE IN THE USA. A PIECE OF HISTORY THAT CAN BE PASSED DOWN TO EACH GENERATION! ALSO, A NICE GIFT FOR ANYONE ASSOCIATED WITH THE MARCH OF DIMES! A GIFT FROM THE PAST MAKES THE PRESENT SPECIAL. IF YOU NEED A SPECIFIC DATE WE WILL TRY TO ACCOMMODATE.